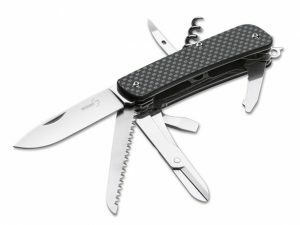 The Boker Plus Tech-Tool Carbon 7 has a modernized construction based on solid steel liners that are embedded in two contoured handle scales made out of lightweight carbon fiber. The Swedish Sandvik 12C27 steel, with a Rockwell hardness of 58-60 HRC, provides outstanding edge retention for the hollow ground blade. The high quality manufacturing, with a smooth blade action and optimized operability, are proof of the premium quality of this tool. Tools included: glass-breaker, screwdriver with bottle opener and wire stripper, small serrated blade with screwdriver tip, corkscrew, foldable lanyard hole, scissors, punch/awl, wood saw, pocket clip. Nearly 150 years ago, Heinrich Boker founded Heinr. Boeker & Co. in Solingen, Germany and has since maintained a solid reputation for producing high-quality shaving blades, scissors and pocket knives. Since the early 1900s, the majority of their products were primarily distributed in the US market through their American sister company Boker USA, which happened to be owned by a close family member living in America. Pocket knives had quickly become the largest share of demand in America and to keep up with the demand, Boker USA began production of their own line of pocket knives. Boker USA has changed hands a few times over the years, but it is once again the primary distributor of Boker knives made in Solingen for the US market. Boker Plus Tech-Tools series knives are available in eight different tool configurations that accompany a rugged 2.75″ full hollow-ground blade with a secondary bevel and a stylish drop-point blade profile. The blade is 2.3 mm thick and made from a high-quality Swedish Sandvik 12C27 steel that has been heat-treated to a Rockwell hardness of 58-60 HRC for improved edge retention, without being too brittle or difficult to sharpen. The overall length with the blade deployed is 6.5″ and comes from the factory very sharp and ready to work. In addition to the beautiful polished blade, all models also include a glass-breaker and a rigid tip-up/tip-down reversible pocket clip for excellent pocket retention. 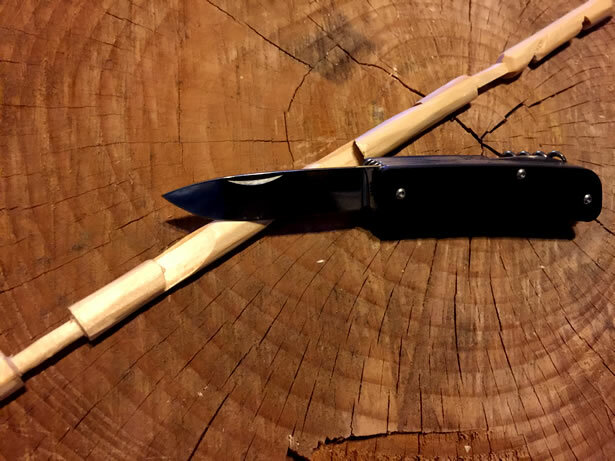 Each of the tools, including the blades feature a smooth slipjoint action with a strong biased tension holding them in the open and closed positions. Each of the tools are made from a tough 4Cr13 stainless steel for its superior resistance to rust and corrosion, without being too hard or brittle for common tools. Tech-Tools 1: large blade, glass-breaker and reversible pocket clip. Tech-Tools 2: large blade, glass-breaker, screwdriver with bottle opener and wire stripper, small serrated blade with screwdriver tip, corkscrew, retractable lanyard hole and reversible pocket clip. Tech-Tools 3: large blade, glass-breaker, screwdriver with bottle opener and wire stripper, small serrated blade with screwdriver tip, corkscrew, retractable lanyard hole, scissors, punch/awl and reversible pocket clip. Tech-Tools 4: large blade, glass-breaker, screwdriver with bottle opener and wire stripper, small serrated blade with screwdriver tip, corkscrew, retractable lanyard hole, scissors, punch/awl, pliers, wood saw and reversible pocket clip. Tech-Tools 5: large blade, glass-breaker, screwdriver with bottle opener and wire stripper, small serrated blade with screwdriver tip, scissors, retractable lanyard hole, punch/awl, pliers, Phillips screwdriver and reversible pocket clip. Tech-Tools 6: large blade, glass-breaker, screwdriver with bottle opener and wire stripper, small serrated blade with screwdriver tip, corkscrew, retractable lanyard hole, punch/awl, wood saw and reversible pocket clip. Tech-Tools 7: large blade, glass-breaker, screwdriver with bottle opener and wire stripper, small serrated blade with screwdriver tip, corkscrew, retractable lanyard hole, scissors, punch/awl, wood saw and reversible pocket clip. Tech-Tools 8: large blade, glass-breaker, screwdriver with bottle opener and wire stripper, small serrated blade with screwdriver tip, retractable lanyard hole, Phillips screwdriver, punch/awl, wood saw and reversible pocket clip. Tech-Tools series knives all share the same closed profile between them, with a length of 3.75″ and a width of 0.875″. However, the thickness is obviously dependent on the tool configuration. In the case of the Carbon 7 model that I have here, the thickness is just a hair shy of 1″ which in my opinion is the maximum that I could comfortably fit in my hand. All tool configurations are available in three attractive scale options that mount cleanly to the knife’s rugged stainless steel frame, the City with black G-10 scales, the Outdoor with green G-10 scales and the Carbon with Carbon Fiber scales. In addition to the drop-point blade, the Tech-Tool 7 components include a saw blade is a hair over 1mm thick and just over 3″ long with aggressively set teeth machined to cut in both directions so it cuts very efficiently, even on hard woods. In the next channel, there is a pair of scissors with a sharp 1″ cutting surface and 1.5″ spring-loaded handles that generate plenty of leverage to operate the shears. In the last channel, on one end of the handle, there is a bottle opener on one end, with a large flat-tip screwdriver tooled into the end and a wire stripper set just behind the hook, easily capable of stripping wire up to 12-gauge. On the other end of the handle, but in the same channel, there is a small flat-tip screwdriver tooled into the end of a small serrated blade approximately 1″ long. This blade folds out to about 45° which feels a little awkward when operating the small screwdriver, but not so much while cutting with the short blade. Only time will tell how this will work out, but at this point I don’t think I’d use the screwdriver or serrated blade much. Right alongside the small blade, there is a small retractible lanyard hole for those times when you need to tether the knife rather than lose it. On the backside of the handle, there is a rugged corkscrew and a sharpened awl, perfect for boring holes in a number of materials from hard woods to soft leathers. 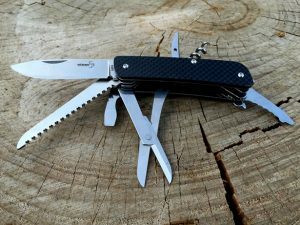 To test the functionality of Boker’s Carbon 7 using methods consistent with testing other folders and multi-tools, I chose to perform three functional tests that demonstrate Fine Blade Control, Tip Strength and Edge Retention. The first thing that I needed to do was to take a 16″ stick, debark it and shave it down to a consistent 3/8″ in diameter, straightening it as best as I could along the way. For this size knife, 3/8 is the perfect thickness for a “Try Stick” which will allow me to test the knife in a consistent way with testing other knives. Once the stick was ready, I decided to feather one end of it as that seems to be a common bushcraft tests for demonstrating both blade control and sharpness. I always try to test knives using a consistent process whenever I can, but I also try not spend an inordinate amount of time on each test. The hollow grind and secondary bevel provide the user great deal of control over the bite of the blade. Within a few short minutes, I had plenty of shavings ready to start a fire. For the second part of this test, I made a Try Stick in the spirit of those originally made by Mors Kochanski as he developed and practiced his skills. There are no rules for creating a “Try Stick”. They can include any number of different notches. The options are almost endless. Over time I will likely explore others as I continue to learn. But for now, I decided to standardize on the most popular variation and closest to the original consisting of ten common bushcraft notches; Blunt End, Reduction, Pot Hook Notch, Saddle Notch, Dovetail Notch, Latch Notch, 90° Planes, Bow Notch, V Notch and a Root Stripper. 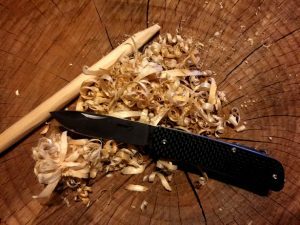 Since this review is on a multi-tool and not on the blade itself, I felt my testing should also be focussed on the functionality on the tool as a whole as well. As a result, I opted to use the mix of tools wherever I could as part of the functionality testing. However, in the case of this project, the saw was the only other usable tool. None of the other tools really made any sense for use on the try stick. The saw blade performed quite well. Within a few strokes back and forth, each of the crosscuts that I had made were clean and just as deep as they needed to be. 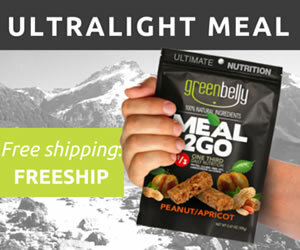 Its aggressive dual-action teeth removed material extremely fast, but free of any splintering. The hollow-ground blade and secondary bevel performed exceptionally well at removing material as I worked my way through each notch. From the first to the last, the blade was easy to control no matter how much material you were trying to remove with each stroke. It was easy to be as delicate or as aggressive as you needed to be. Although there were a few times that I wished it had an active blade lock. Especially when I was using my thumbs against the spine of the blade for leverage. Once in a while it felt like the slipjoint wasn’t holding the blade all the way open leaving me a little worried that it might close at an inopportune time causing a serious injury. To test the strength of the tip, I performed the simple test of boring a hole in the end of a 12″ stump. To do so, I twisted the knife back and forth as I applied a steady downward pressure until I had a hole approximately 1/2″ deep and 1/2″ across. It took a little less than 3 minutes to bore the hole, leaving no chips or damage to the blade whatsoever. The final test of the Carbon 7 was to demonstrate its edge retention throughout the testing by slicing through a single sheet of copy paper with the same level of effort that it had prior to all the testing. The testing left behind no visible sign of cracks or chips of any kind, and with a quick wipe of the blade with a lightly oiled rag you could hardly tell it had ever been used. But as I sliced through the paper, I found a minor burr near the upward turn of the blade’s edge that was enough to affect the outcome of the test. As a result, the edge could use some tuning with a fine sharpening stone or ceramic rod. The Boker Plus Tech-Tool Carbon 7 is a robust multitool engineered with German quality in mind. Regardless of being made in China, the quality remains very high. The primary blade is tough and remarkably sharp right from the factory. Each of the tools are rugged performers from the scissors to the saw blade, easily capable of performing rigorous tasks. Multi-purpose pocket knives like this one are ideal for EDC, providing a multitude of tools in one small package. 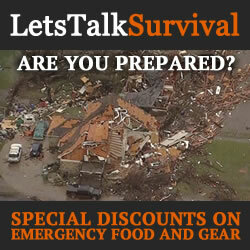 They are especially useful when you don’t have your EDC pack with you. Although, they are not for everyone. Some people do prefer folders, and others prefer fixed blades. But if multitools are for you, these Boker knives should be near the top of the list… Two thumbs way up! Today Boker is renowned all over the world as manufacturer and supplier of an unmatched variety of blade and handle materials and biggest manufacturer in Europe for Sport Knives, Tactical Knives and Collector’s knives.